Most people tend to think of mass social violence as the result of mostly random chains of events. It is not. Societies experience waves of social mood, and the best measure of a society’s mood pattern is its stock market. Our studies show that mass violence is most likely to erupt after stock prices have fallen for some time, usually near the end of corrective waves. Not every major decline results in mass violence, but whenever mass violence does erupt, we find that a bear market is usually in force. The revolutionary “days of rage” that are spreading like wildfire across the Middle East are an excellent example of this relationship. Arabian stocks now have either fallen or made no net progress for about five years. Some markets, such as Dubai, continue to fall to new lows in their bear markets (see Figure 1). Others, such as the region’s leaders—Qatar, Egypt, and Lebanon—bottomed in 2009 and have since risen progressively and pulled back for a third time (see Figure 2). As the December 2010 issue of The Socionomist pointed out, the decline in social mood to the 2006 low in the region produced the Lebanon War between Hezbollah and Israel; the decline to the 2007 low produced the Battle of Gaza between Hamas and Fatah; and the 2008 to 2009 decline produced the Gaza war between Hamas and Israel (click here for chart). The current correction, which is likely to be the final decline within the five-year bear market, has motivated people to overthrow or threaten their governments throughout the region. Violent events accompanied lows during the region’s most severe bear market, from the mid-1990s to the early 2000s (Figure 3). Near the end of the 1996 correction in Egypt’s Hermes Index, Al Qaeda militants bombed the Khobar Towers in Saudi Arabia, and Osama bin Laden announced his fatwa against the United States. Al Qaeda then bombed the U.S. embassies in Kenya and Tanzania near the 1998 low and bombed the USS Cole in Yemen near the 2000 low. But the most dramatic event of the period occurred near the end of the bear market, when Al Qaeda attacked the United States on September 11, 2001. The revolts of 2010-2011 have overthrown the governments of Tunisia and Egypt, which had wielded power for decades, and have challenged the existence of several others. It is important to remember that stocks do not cause events, nor do events move stocks. Stock movements and other social actions are driven by social mood. 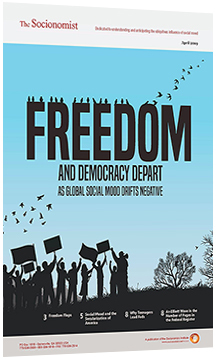 Changes in social mood motivate decisions to take social actions of many types. Actions such as buying and selling stocks, which can be taken almost immediately in response to social mood, are early indicators of mood and can be used to anticipate actions that take more time to effect. Thus, stocks are a good leading indicator of many other types of social actions, including macroeconomic and political trends. Mark Galasiewski is editor of Elliott Wave International’s The Asian-Pacific Financial Forecast. This article is excerpted from the publication’s February and March 2011 issues.